› Author AffiliationsThis work was financially supported by CNPq and Faperj. Heterocyclic chemistry is an essential frontier in science and a source of novel biologically active compounds. The development of innovative synthetic methodologies that allows access to different heterocyclic rings is of critical interest to the scientific community. 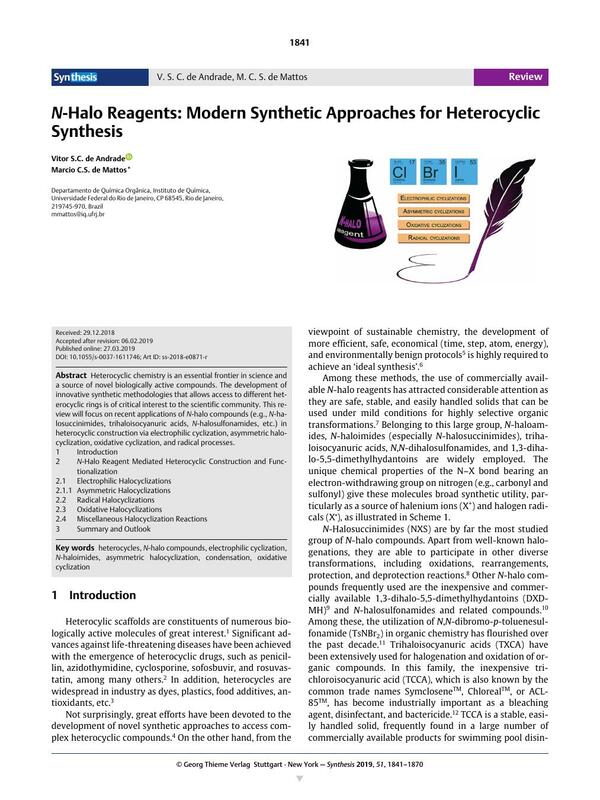 This review will focus on recent applications of N-halo compounds (e.g., N-halosuccinimides, trihaloisocyanuric acids, N-halosulfonamides, etc.) in heterocyclic construction via electrophilic cyclization, asymmetric halocyclization, oxidative cyclization, and radical processes.